Born September 10, 1934 in Rotterdam, Netherlands. Fred was a natural talent and while still living in Holland, at the age of 17 he was selected to the Dutch National Youth team. When he turned 19 he joined FC Excelsior, which at the time was a top club within the country. He played there for three and half years. 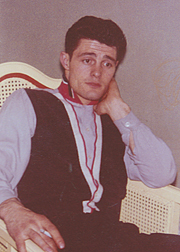 Fred immigrated to the United States in 1957 where he joined Hollandia S.C. He moved to A.C. Alemannia in 1960 where he played with many other players who are now part of the Utah Soccer Hall of Fame. A.C. Alemannia was the best team of the during 1960’s and during his stay from 1961-64 they won the Daynes Challenge Cup & State Championships in each year. In 1964 he went back to Hollandia S.C. where the club added another State Championship in 1965. In 1967 Fred, along with some of his friends joined Incas S.C., where the club won State Championships in 1967 and 1969. Fred made his last move in 1969 when Sports Club United was formed and he was able to add two more State Championships to his resume in 1970 & 1971. His presence on the field was immense during his entire playing career, known for having a cannon for a shot, but mostly for being skillful and a gentleman. A perennial All-Star Team player throughout his playing career, Fred was a player who, without doubt, will be on the Association’s all-time All-Star team when that selection is made.